The Marmara Manhattan has 109 suites in a 32-story luxury building. Conveniently situated only steps away from Big Apples culture centers such as the Metropolitan Museum of Art- The Jewish museum- National Academy of Museum and School of Fine Arts- Solomon R. Guggenheim Museum- El Museo del Barrio- Neu Gallery New York- The Museum of the city of New York and The Goethe Institute as well as the world famous New Yorks jewel-Central Park. The Marmara Manhattan boasts deluxe turn-key urban New York Style living in a serene sophisticated environment. There are elegantly furnished one-two and three-bedroom deluxe suites and studios providing the comfort and convenience of a fine home with in-room business facilities including complimentary wireless internet suitable for those who are visiting New York City . 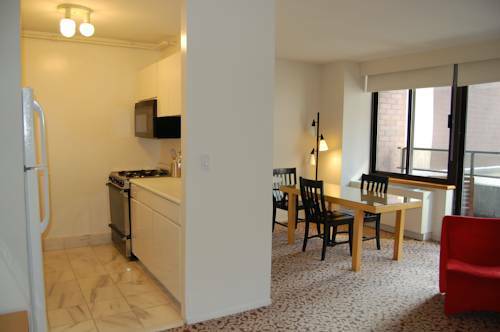 The spacious accommodations which include fully equipped kitchens all have large sunlit windows many offering stunning views of Manhattan ranging from the Empire State Building to the South to the bridges over the East River. More than 80 of the suites have balconies off the living rooms and some have Jacuzzi- equipped baths. Marmara Manhattan is the choice if you want to feel like a local in the Big Apple.